Carnoustie’s conditions presented a unique form of “moving day” with scoring conditions for the professionals optimized. There was no wind (until the very end of the day) to speak of, prior day’s spits of rain slowed the pace of the greens considerably to a stimp reading of 9.5 and the rough’s condition was mostly benign. The player’s eyes were wide open. This was the day to score on this course if there ever was one. Justin Rose playing in the first group of the day shot 64 to move from just making the cut to 13th in the tournament. 19 players are within 5 shots from the leaders (Tiger Woods among them) which will provide tremendous excitement for the final round. 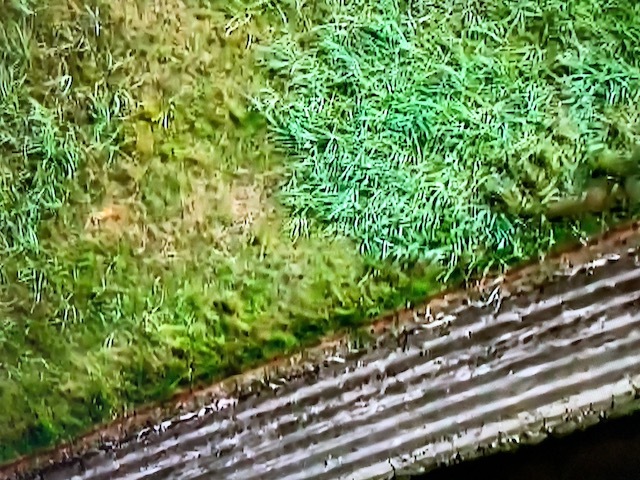 I always wince when conditions are like this in a Open Championship event. 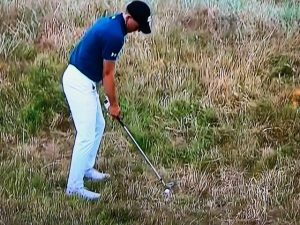 Every time I play an Open Championship venue it is raining, windy, cold and the rough is usually up to your knees. Carnoustie’s fairways are yellow and drives in the fairway are running forever with the power of the tour player. Rory McElroy hit a plethora of 300 yard drives and hit one 408 yards on the 14th hole. The yellow fairways, characterized by drought conditions in the area, were labeled “fiery” and added at least 75 yards to every drive in the fairway. The average drive for the event thus far is over 300 yards. The day would be memorialized by a number of spectacular shots on a course that was literally defense-less. Jordan Speith started his day off by driving the 380 yard first hole and holed the putt for an eagle 2 to immediately move to 5 under. He would play aggressively all day and had another adventure on the 12th hole where his drive found the right rough facing a blind shot to the green. In 2017 at Birkdale, Speith made another spectacular shot to save what could have been a big number which propelled his march to the 2017 title. 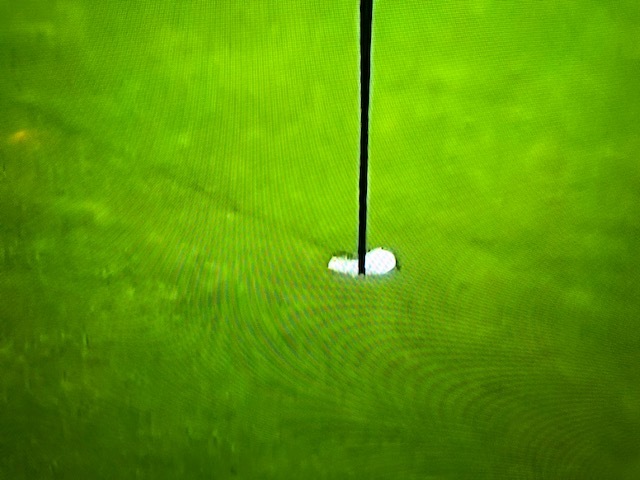 Speith would make another improbable par from that spot. 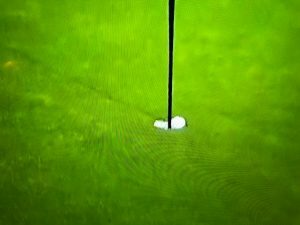 Speith was fortunate on the 18th hole as he aggressively chose a driver and hit into the left rough about 155 yards from the hole. He would have to cross the Barry Burn but his ball lay nicely in the rough almost as if it was in the fairway so he had no trouble navigating the hole from there and finished with a par. Tiger Woods played a very consistent round of golf and could have been a little closer as he missed a few short putts as he stands 4 shots back at 5 under. He is actually leading the event in driving accuracy. 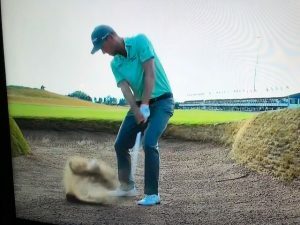 On the 18th hole, he selected a driving iron on the treacherous finishing hole and his ball was pulled left heading for the infamous Barry Burn. The ball bounced off a stone on the burn and got a miraculous bounce to the right instead of going into the burn. 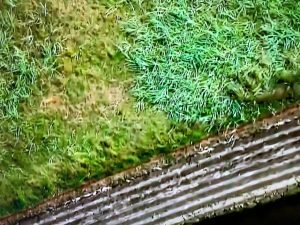 Tiger played out of the deep rough to about the 50 yard mark where he then finessed a 56 degree wedge to 2 feet for a closing par. Phil Mickelsen was in a similar spot on the 18th but decided to carry the Barry Burn with a mighty blow that carried the burn where he two putted for a closing par. While the players were making all of these shots and going low, Kevin Kinser was “steady Eddie” as he continued to make putts and hang onto the lead. Kinser has had a pretty miserable year this far but he will be hard to beat if he continues to make the putts. On top of all this, Xander Lombard from South Africa was not having a good day as he approached the 18th–2 under and over par for the day. After a good drive in the fairway, Lombard took advantage of the 24 mph favorable wind and holed the shot for an eagle 2 to finish at 4 under. Lombard’s eagle was the first eagle at Carnoustie’s 18th hole since the course became an 18th hole venue. Tomorrow might be a different scenario for course conditions. It is expected to rain and the winds will start to come up. Driving the ball in the fairway will be critical as wet rough will make lies very difficult. It’s going to be difficult to win in these conditions and somehow it’s likely that the Barry Burn will be a factor again by day’s end. Tiger likes his chances in these conditions especially if he can play as consistently as he played today. It’s going to be an exciting conclusion and I wouldn’t be surprised that we will see another playoff. The End of the Rain?